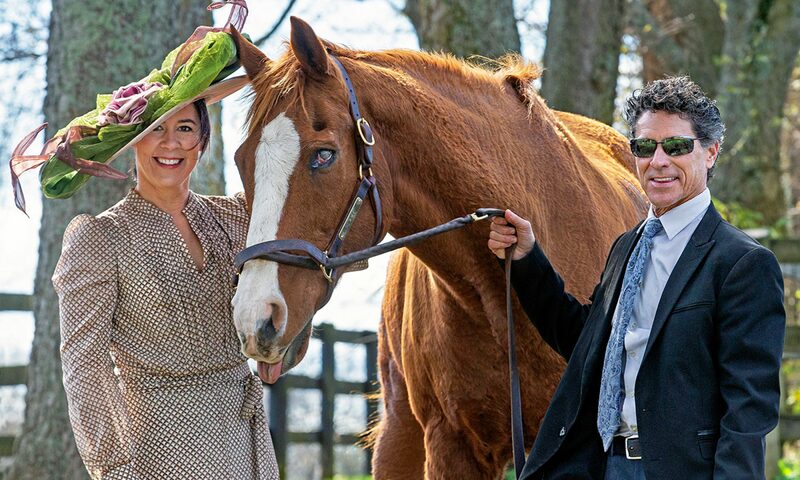 At MAGGIE MAE DESIGNS® I personally design and create ladies’ fancy dress hats for the Kentucky Derby, Royal Ascot, weddings, garden parties and tea parties all over the world. To me the business is personal; I encourage customers to think of me as their personal milliner, ready to assist them in their search for the perfect chapeau. The process begins with me asking a lot of questions. What is the occasion? Is there is an outfit that needs to be matched? How comfortable are they wearing a hat? We exchange swatches, photos and ideas by as we get to know one another and gradually the perfect hat design for them emerges from the process. Last August, Robin Stater contacted me about designing a hat for her fall wedding. She described herself and her sweetheart Philip Hertzog as “two independent souls,” which was reflected in the creative choice of an Old West setting for their wedding at the Law Railroad Museum in Bishop, CA. The suggested attire for guests was “Old West and Victorian/Gothic”. To add to the fun would be Robin’s grand entrance riding her gorgeous Tobiano paint horse, Major Proof, alongside her friend Janet Titus, her natural horsemanship horse trainer, and Janet’s husband, Dave. All that was missing was the perfect chapeau to make her wedding dream complete. From the very beginning Robin’s vision for the hat was clear: she loved my classic “Billie” mini top hat fascinator but wanted to customize it a bit to match her beautiful gown, a black and white embroidered organza confection with a hint of lime green and fuchsia accent. We got to work, starting with a photo of the dress. Robin decided on ivory silk for the top hat base. Her idea for a “chalkboard” (washed out black) tone for the trim was achieved using charcoal organza to fashion the leaves that framed the rose curl centerpiece. As we worked on the design together Robin used descriptions like “Victorian”, “elegant”, “Gothic”, “funky” which gave me the ideas for what she wanted. Fabric swatches were exchanged and Robin special ordered a silver metallic veiling she’d found online. I chose a soft ivory silk for the top hat foundation, ivory silk organza for the rose curl, sparkling rhinestone buttons and fancy braiding; Robin’s perfect choice of the silver veiling did indeed help pull it all together. On October 6, 2012, “Robin’s Billie” chapeau made her grand debut as Robin arrived for the wedding ceremony astride her beautiful paint horse. The vision took everyone’s breath away. Wedding guests told Robin that the hat was absolutely perfect; they were amazed that we were able to create such a perfect and magical hat even though we lived so far apart. As collaborative artists, my customers and I create hats that are one of a kind and perfectly suited to their needs and sense of style. The physical distance disappears as we connect, share and create magical custom chapeaux together. Like my hats, I have designed my business to be unique; a true custom millinery that encourages one to think outside the box. And because each hat is created individually and sized to fit, their MAGGIE MAE DESIGNS® chapeau feels like it was made “just for them” – because it was! And I think my customers would agree with me when I say, the business just has to be personal. A very special thank you to Robin Stater and Susan Morning (SUSAN MORNING PHOTOGRAPHY) for allowing me to share these wonderful images of Robin’s special wedding day with you! Sally, what a fantastic insight into how you create such beautiful hats. It’s really amazing how you were able to seamlessly marry all those components, like the chalkboard gray and the veil she ordered online, into a centerpiece of her wedding attire. And, it looked stunning with her gown! This was so interesting and I loved getting to see this wedding. what a handsome couple. so certainly knew how to make their wedding different, personal and beautiful. thank you for sharing it with us. very nice Sally! really enjoyed reading and seeing the photos. Thank you so much, Jackie, it was such an amazing creative adventure! These words come to mind when I read this blog because it is clear that you carry Maggie Mae Designs in your heart! You have a passion for your craft and are solicitous to your clients’ needs. Bravo, Sally Steinmann, for executing Robin Stater’s vision so beautifully, and thank you for offering us a glimpse of your world! Hi Robin, you are SO welcome, and it is I that needs to thank YOU! People love the vision you had for your wedding, it truly must have been a magical day. And the HAT seemed to fit right in beautifully, thanks to all your clues and ideas. Thank you, Robin, for the experience and all the fun of creating the “Robin’s Billie” chapeau! Sally, what a beautiful job you’ve done with the blog! I knew you had it in you. How nice to find another home for your passions, horses and hats. I guess I should call a hat a chapeau when commenting on your blog. I’ll mind my manners from here out. I hope this site brings you lots of smiles and satisfaction! Hi Dave! How great to find you here in my Comments, so glad you like the new blog. I’ve wanted to do it forever, and now was the time. You’re funny about “chapeau” — but then, you know what they say about a rose, right? So no worries – hat, chapeau, topper, it all works! 🙂 Thanks for your well wishes, Dave, and I’ll keep trying to share stories about the things that matter to me. Please visit again anytime! A perfect complement to her dress…and great photos! What a lovely wedding!